Children from Braehead and Carnwath primary schools got fit and active at the Tesco Bank Football Challenge at Hampden Park on June 12. Brighton and Hove Albion player Jamie Murphy was on hand as hundreds of children from schools across the country, who have all taken part in six weeks of coaching with the Scottish FA, came together for a fun-filled finale at the National Stadium. Jamie said: “It has been a fantastic day here at Hampden, and it’s brilliant to see so many boys and girls having fun playing football on the pitch. “This scheme helps to instil the importance of an active lifestyle at an early age and gives children memories they’ll keep for a long time. 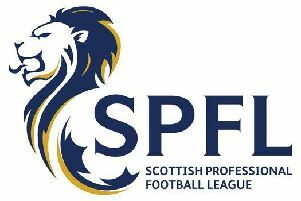 The Challenge is now in its seventh year in partnership with the Scottish FA. Every year the project introduces 20,000 children to football in primary two and three (six to eight years old) across Scotland to help get them involved in a healthy and active lifestyle. More than 120,000 children across 2200 primary schools in Scotland have now engaged with the country’s leading football participation initiative. Teachers and volunteers also enjoy the Scottish FA’s in-service programme with more than 7500 trained to support the growth of football in schools.